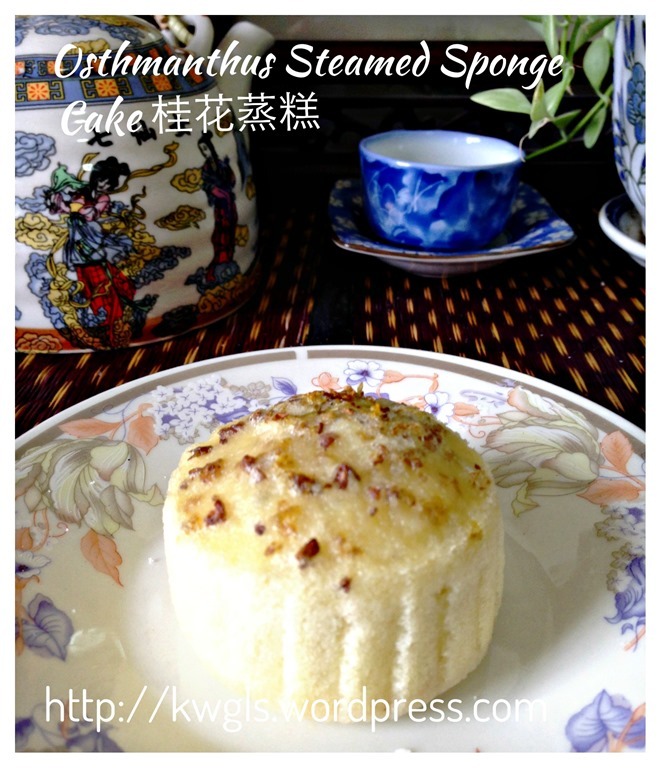 Mid autumn festival and mooncake festival will be few days away and I thought besides mooncakes, it might be a good idea to have some osmanthus steamed sponge cake to join the “celebration”. 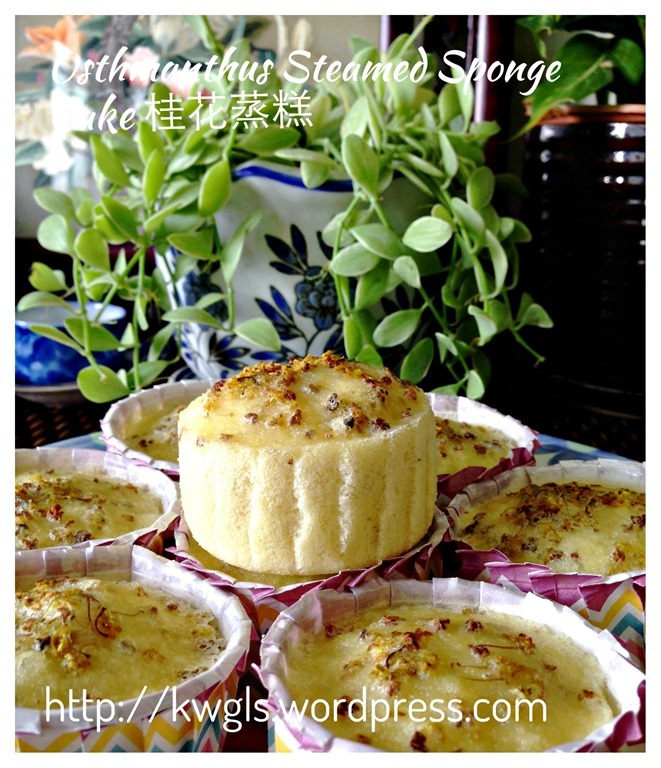 For those who can’t eat mooncake, may be you can consider as a substitute.. 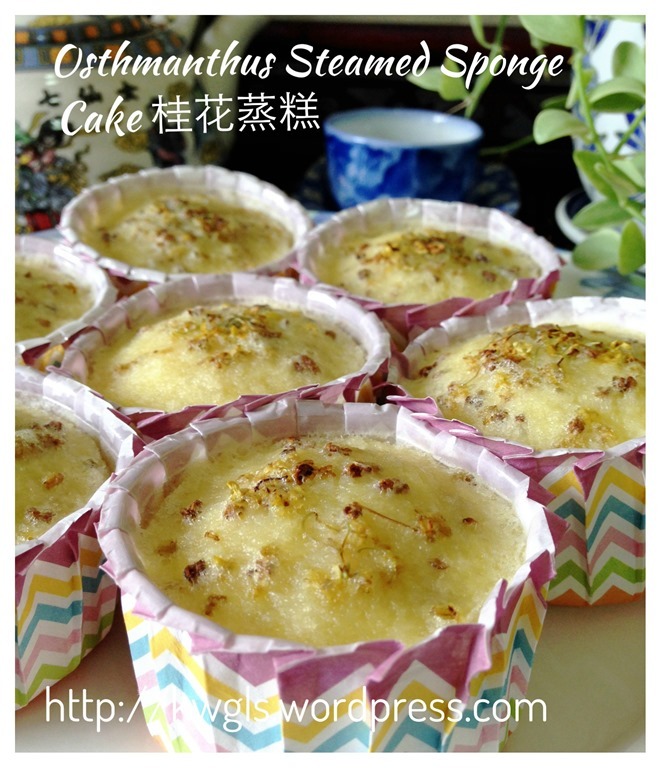 Does osmanthus have anything to do with this important Chinese festival? In fact, yes and it is a very important flower as you can inferred from the following description common found in Chinese writings. 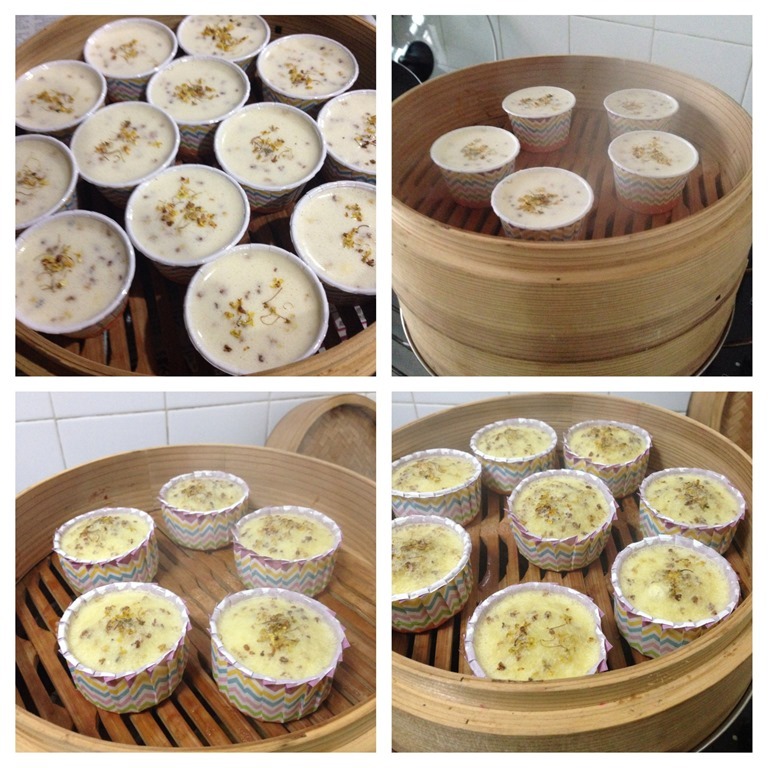 During Mid Autumn Festival, Chinese are celebrating by sitting under the osmanthus trees (桂花树下）, appreciate the osmanthus flower （赏桂花）, drinking osmanthus wine or cassia wine（喝桂花东或蜜酒）and osmanthus tea ( 饮桂花茶). 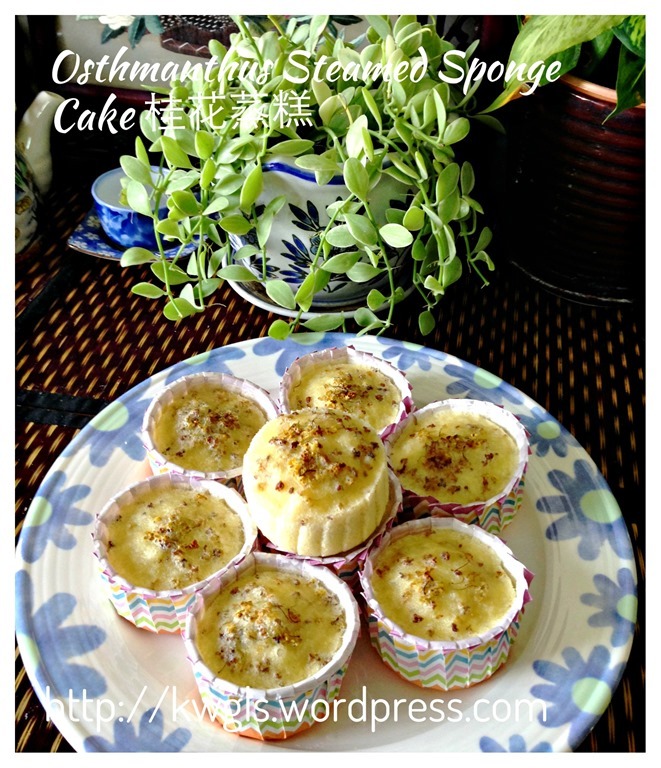 In addition, osmanthus blossom in Autumn together with many other beautiful flowers such as chrysanthemum. Of course, we shall not forget an old legend relating to the moon -Wu Gang felling the osmanthus tree (吴刚伐桂. In the moon palace (月宫）where Chang E (嫦娥）stay together with the jade rabbit (玉兔）， Wu Gang was punished by the God to cut a self healing osmanthus tree in the moon palace and whenever he chop the tree, the tree will heal itself. This soon become a phrase in modern Chinese to describe an endless toil with a futile effort. “Osmanthus /ɒzˈmænθəs/ is a genus of about 30 species of flowering plants in the family Oleaceae. 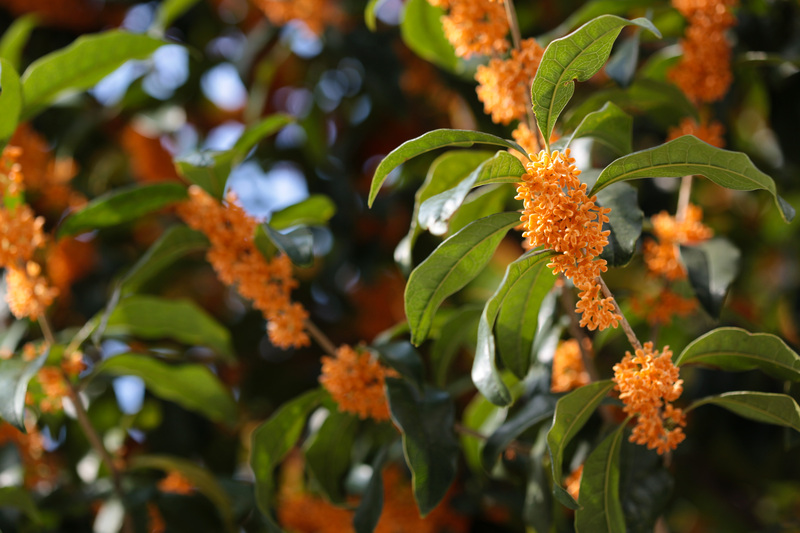 Osmanthus range in size from shrubs to small trees, 2–12 m (7–39 ft) tall. The leaves are opposite, evergreen, and simple, with an entire, serrated or coarsely toothed margin. The flowers are produced in spring, summer or autumn, each flower being about 1 cm long, white, with a four-lobed tubular-based corolla (‘petals’). The flowers grow in small panicles, and in several species have a strong fragrance. The flowers of O. fragrans are used throughout East Asia for their scent and flavor, which is likened to apricot and peach. 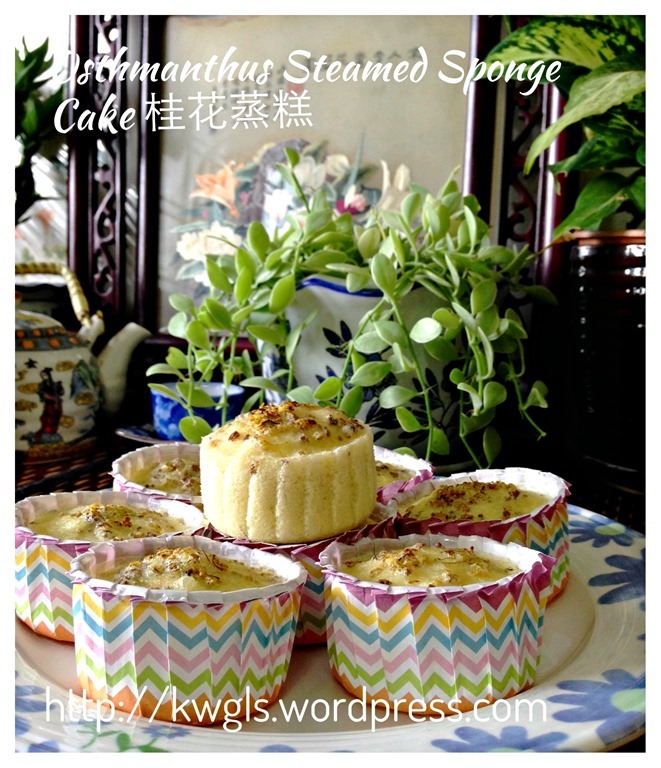 This is a creation of my own and in fact, a simple steamed sponge cake. 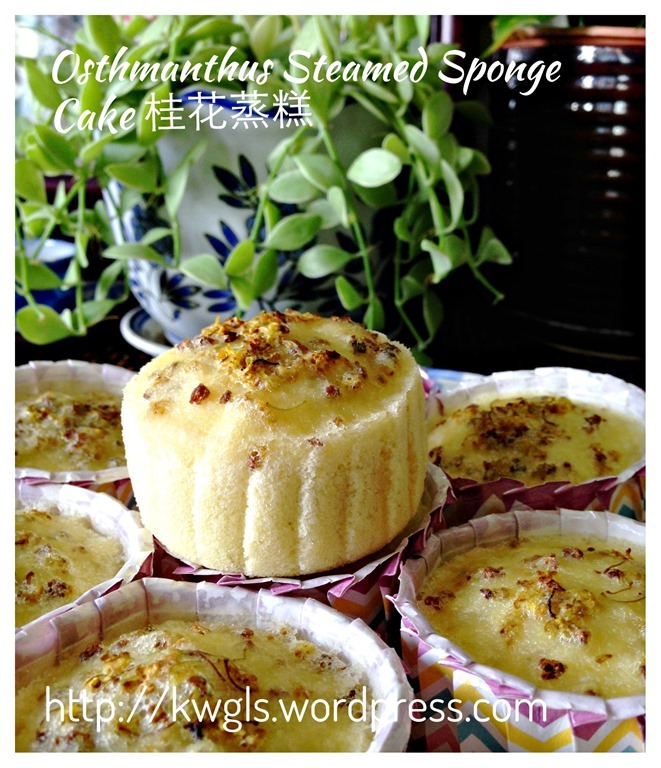 I have created this recipe purely for the sake of Osmanthus role in Chinese Mid Autumn Festival and also as an alternative for those who can’t take mooncake for a particular reason. 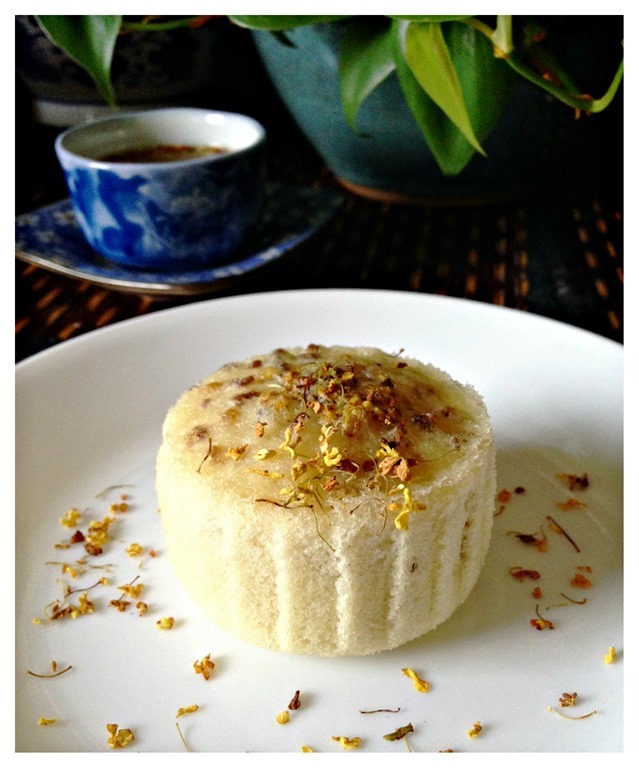 Of course, you can always have prepare this cake as a snack. Steep 2 tablespoon of dried osmanthus with 25 ml of hot water. Set aside for later use. (in this illustration, I did not steep the flower and hence the fragrance is not obvious). 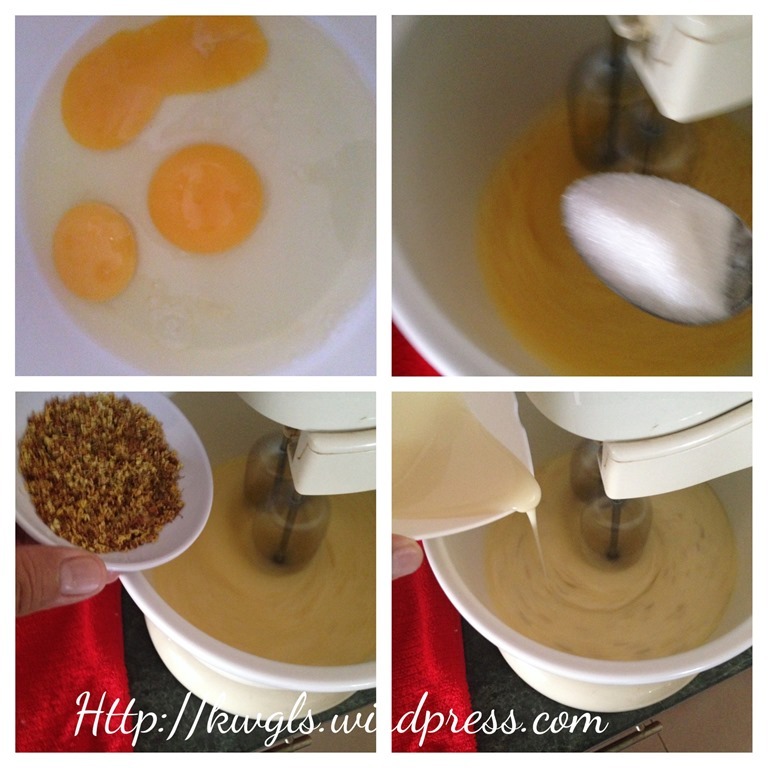 Beat the egg until foamy, add sugar tablespoon by tablespoon until pale and volume expands. 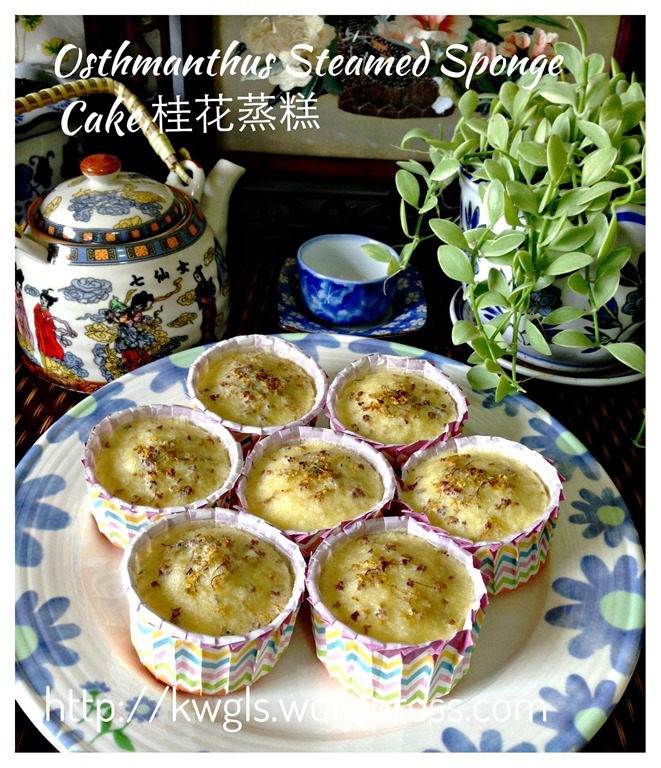 Add the osmanthus tea gradually followed by the condensed milk. Add the cooking oil (optional) and beat until well combined. 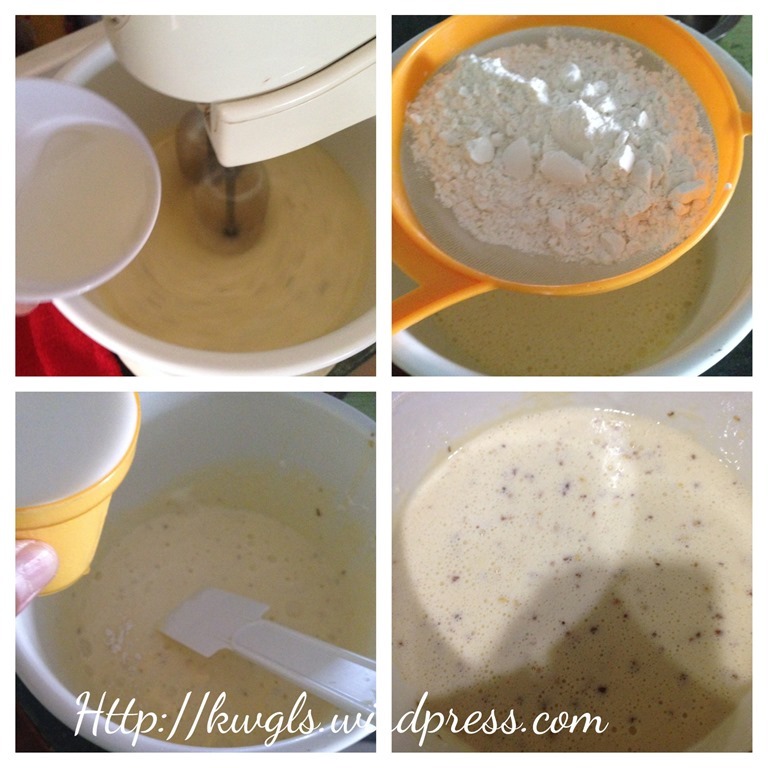 Sift in the self raising flour and alternate with milk in 3 stages. 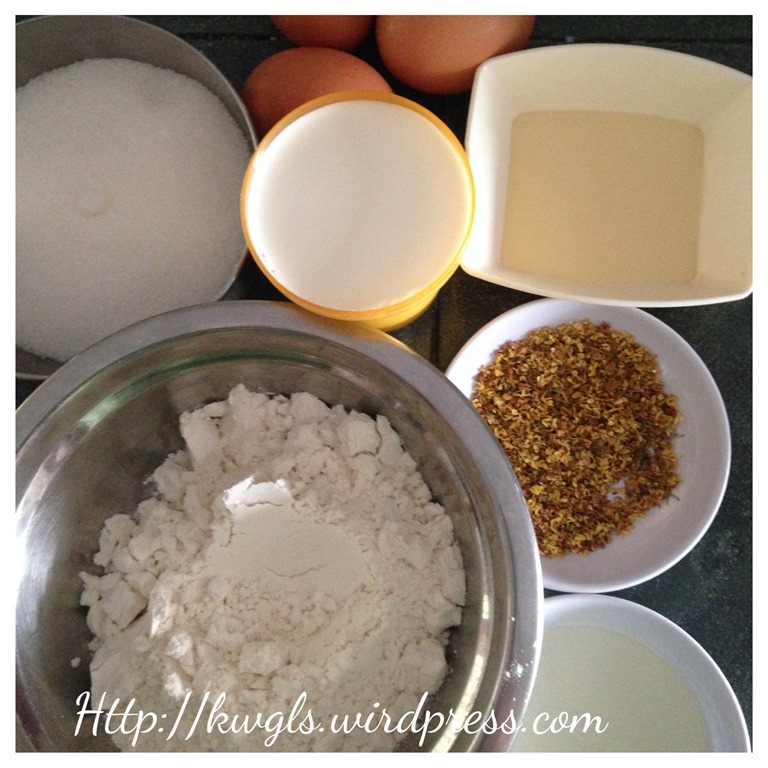 Fold until well mixed. Pour the batter in the cupcake cups and transfer to the steamer tray. 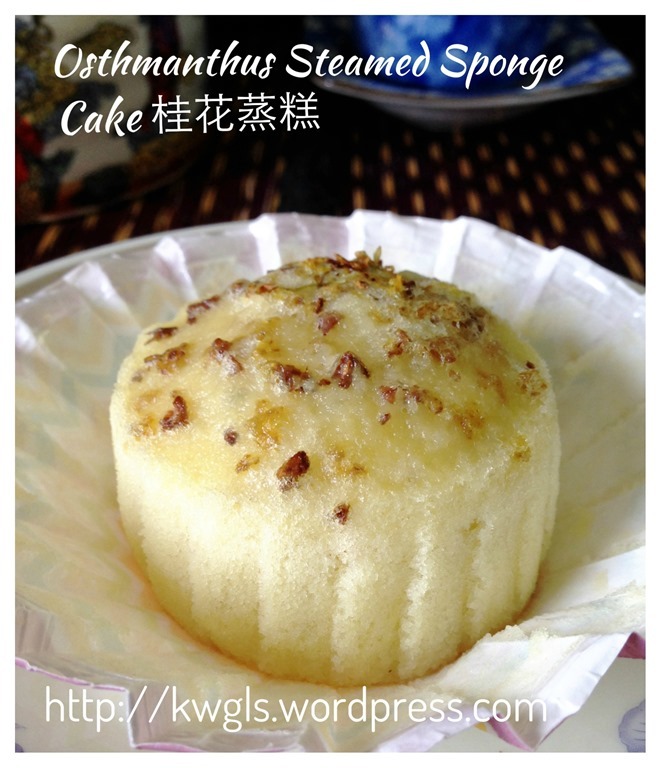 Steam the cake under high heat for 15-20 minutes or until a skewer inserted comes out clean. 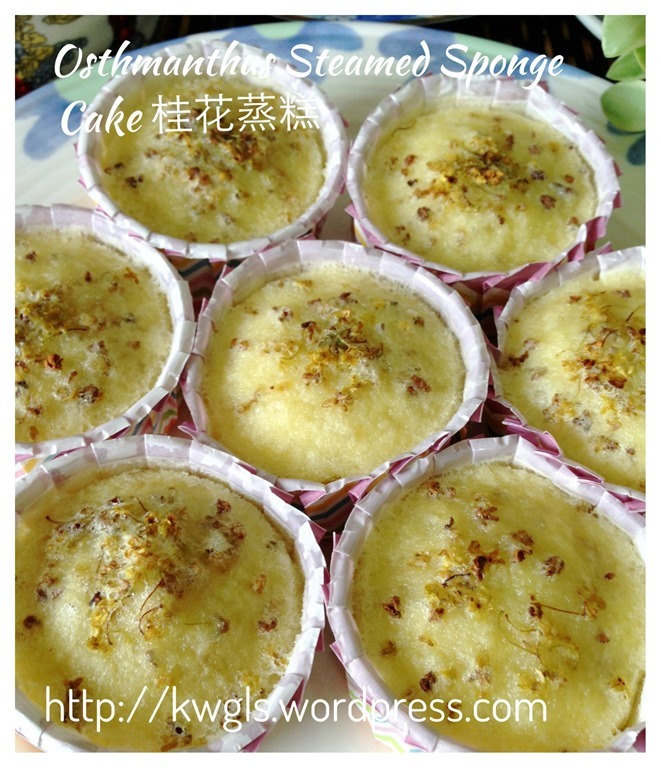 Besides eating mooncakes, why not try having some of these healthier osmanthus steamed sponge cake? 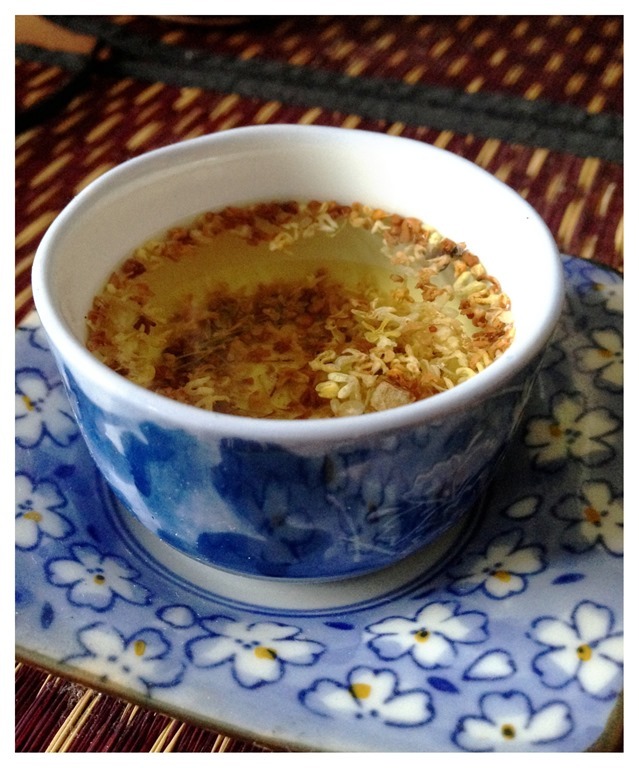 Before I forget, you can get these dried osmanthus flower rather easily in traditional Chinese medicine stores, bakery shops or shops that sell the tea leaves. 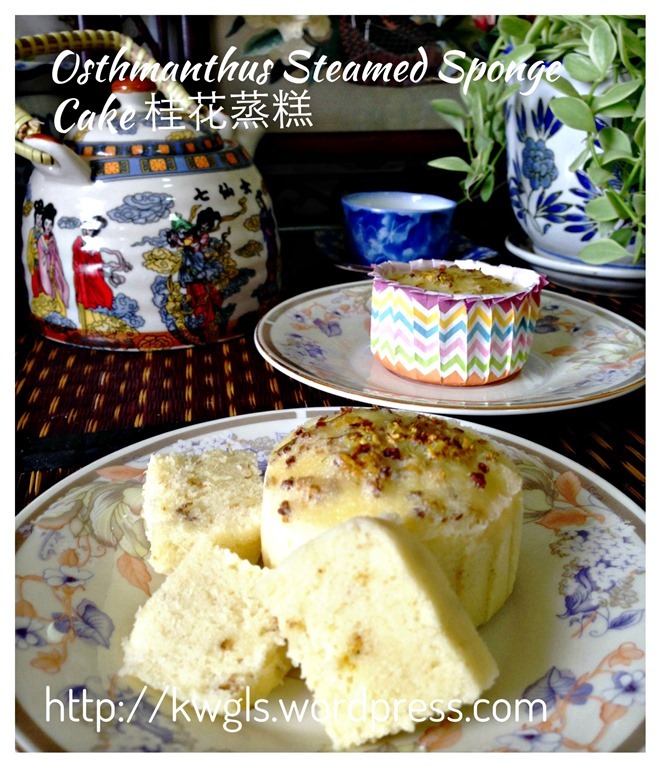 This entry was posted in Chinese and Asian Cakes and Snacks, Food Preparation Series, Snacks and tagged 8, GUAI SHU SHU, Guaishushu, kenneth goh, osmanthus, postaday, 桂花蒸糕， 吴刚伐桂，osmanthus steamed cake. Bookmark the permalink.